Having lead family worship in our home for nearly thirty years with reasonable consistency and intentionality, I must confess that it is not one of my more successful endeavors. Although I have not had the courage to poll them, I suspect that “boring” and “bland” might summarize my children’s collective assessment. Nevertheless, by grace, my wife Deni, and I have persevered through the years clinging to the conviction that, in conducting family worship in some form on a regular basis, we are about a noble business the ultimate success of which is not only determined by God but is best left to Him to measure as well. 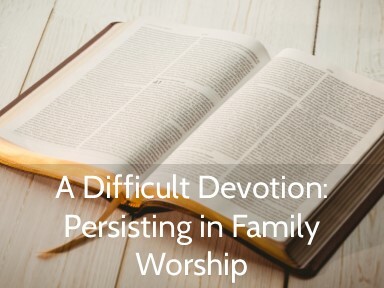 At our house, family worship has taken on many different forms over the years, but almost always it has consisted of three essential elements: God’s word, prayer, and singing. 1) The Scriptural Component—For many years, we used a family worship card distributed by our church that listed daily Bible readings designed to prepare us for the upcoming Sunday’s sermon. At other times, I have simply read a Psalm or other short passage. More recently, I have used a daily reading from a devotional book such as (a) My Utmost for His Highest by Oswald Chambers, (b) C. H. Spurgeon’s Morning and Evening, and (c) Note to Self by Joe Thorn. In the early years, when we had only young children, our Bible readings were “age appropriate.” However, in those middle years when our children’s ages spanned 17 to infancy, I refused to “dumb things down” and stubbornly taught to the eldest level, trusting that the younger ones would glean what they were able and calling on the older children to explain any difficult concepts to their younger siblings. 2) Prayer—The prayer component of our family worship has consisted primarily of thanksgiving and intercession. We collectively identify prayer items, and one or more of us leads in prayer about those particular matters. 3) Singing—Typically, we close our worship with a song, which could be a hymn, a contemporary chorus, or simply the doxology. Beyond content and format, I have learned that consistency is critical to family worship. As in virtually all other worthwhile endeavors, whether it’s physical fitness or personal devotions, so it is with family worship: much more is gained by small incremental efforts consistently applied over a long time than by lavish outpourings that occur only sporadically. Of course, this does not mean that family worship has occurred in our home every day of every week for the past thirty years. However, it does mean that Deni and I, together, have battled hard alongside our children not to succumb to their apathy, my indolence, or the innumerable distractions presented by our varied schedules. Consistency also should not suggest rigidity. In fact, consistency over the long haul is fueled by flexibility. For example, adjusting the time that we conduct our family worship to accommodate our schedules has been the saving grace to this daily endeavor. There was a period of a few years during which we shifted family worship from the dinner hour to the breakfast table because it offered a better fit. If flexibility is the fuel, then brevity is the oil that helps to overcome the frictional forces that grind against consistency. Except for those occasional times when genuine discussion springs forth, our family worship time generally last no more than 5 to 8 minutes. While such brevity imposes limitations, it has been central to preventing family worship from being crowded out by competing demands. So, why do it? We have persisted in this difficult devotion because it affords our family a corporate opportunity to exalt the wisdom, power, and love of our heavenly Father and to acknowledge our need for the grace of Jesus Christ. It is a propitious moment in the day for all of us—together—to be reminded of the gospel. In this sense, family worship is yet another means of grace, literally empowering us to live our lives in a manner worthy of our high calling. As such, can it be said that family worship is “bland” or “boring?” If that is my perspective, then it is simply indicative of my need. And that realization should not discourage me to pursue this blessed opportunity as one who is desperate to drink more deeply of God’s precious grace—desperate for me and desperate for my family. Jay Mitchell currently serves as an elder at Annapolis EP Church. He also served as chairman of the board of directors for Rockbridge Academy. Jay practices law professionally, but adds his favorite avocation is teaching. He has been married to his wife, Deni, for nearly 40 years, and they are blessed with eight children (5 of whom are Rockbridge alumni) and 12 grandchildren. This article was originally published in the spring 2013 issue of The Rockbridge Reporter. Even the average man or woman on the street can see the benefit of going ad fontes. A more common paraphrase of this idea nowadays is when you hear folks say they got their information “straight from the horse’s mouth.” This indicates that their knowledge is from the highest authority. We say this to make the point that our source can personally verify the fact in question because they were there. In our court system, we get after truth by excluding hearsay from witnesses and desire only what they themselves have witnessed or experienced. Of course, there are weaknesses with original source documents. An original or primary source is likely biased in one direction on the issue at hand. The identity of the author may even be in question. Often in our school selections the author is usually no longer alive so they can’t be questioned further to verify what was meant. Semantic range often changes over time, and older writings can be difficult to read and even more difficult to understand. So why not just give the student the Reader’s Digest version of the facts and move along? What some consider a weakness about ad fontes, we consider a strength. Primary source documents must be evaluated within their context, compared with other evidence from the time period, and students must think and reason out their conclusions. Sounds like a dialectic or logic exercise, right? Right! So what does this have to do my third grader? Well, grammar school students gather facts in preparation for later learning. A well-informed foundation in history makes research and evaluation of original sources easier and more familiar. As grammar students grow and are able to read to learn, they learn about The Histories by Herodotus who tells of Demosthenes the great orator (384-322 BC). Later when they read Patrick Henry’s moving “Give me liberty or give me death” speech, it makes sense that the founding fathers called Henry the Demosthenes of his age. Fourth graders memorize the Nicene Creed, and read excerpts from Augustine’s Confessions and Marco Polo’s The Travels. Fifth graders read from Poor Richard's Almanack by Benjamin Franklin and memorize the Mayflower Compact, the famous beginning to the Declaration of Independence, and the Preamble to the Constitution. Sixth graders read from the Constitution, the Monroe Doctrine, refer frequently to its amendments, memorize the Gettysburg Address, and read MLK’s I Have a Dream speech. In Latin, these students translate from Livy the Younger’s letters. The gift of reading original source documents gives the flavor of the times, which not only enlivens the facts but gives emotional insight into the zeitgeist of the times being studied. While going ad fontes gives a foundation for the past, the greatest original source document to read, re-read, memorize, and meditate on is, of course, the Bible. This text builds a foundation for all our lives. Our first graders begin to read from the translated ancient text during this trimester. Second graders read from it with help from their teachers. Third graders read from it daily as a class. Fourth through sixth graders read from it daily, either as a group or individually. While we teach older students about Bible dictionaries and commentaries, we try to keep the main thing the main thing. As your child’s primary educator, you can reinforce this love for first things by reading original source documents together or even going to visit some of the most famous. The Magna Carta, the Declaration of Independence, the Constitution, and the Bill of Rights are a Metro ride away in our National Archives. There is a floor in the Bible Museum that traces the history of the Bible ad fontes. A day trip for your family may help you develop more of an appreciation for a curriculum that is filled with original source documents, especially that most authoritative document of all.